Funny story with this recipe – I made it in June. Of 2016. #winning Also, I am judging my photos; harshly. Okay, okay this post is way overdue but it has been so far back in the recesses of my mind I forgot about it. What really happened was I made this pie last June when gooseberries appeared and by the time I got around to posting it gooseberries were out of season. Normally, this isn’t too big of a deal because most produce is still readily available in “off season” months, but not so with gooseberries. Prime gooseberry season is in June but they are typically available until August if you scour farmer’s markets and local farms. They are extremely hard to find in most chain grocery stores. The good news though is that you can substitute strawberries, additional blueberries or any other softer fruit and still get amazing results. Oh peach with blueberries just came to mind. Mmmmm! That is the awesome thing about pie; you really cannot go wrong with almost any combination. I had a lot of fun playing around with this pie crust design. I did a combination or lattice, braiding and my rose pie crust and I think it turned out quite lovely. Of course doing a standard top crust with a few slits or cut-outs would be perfectly lovely too. If you have time to play though you should go for it! Notes: You can substitute any soft fruit for gooseberries in this pie. A rule of thumb I use to sweeten in ¼ cup of sugar to each cup of fruit. If I have strawberries or blueberries that are particularly sweet I will use a little less. 1. Preheat oven to 375 degrees. In a small bowl beat egg with a tablespoon of water and set aside. 2. In a large bowl, combine gooseberries, blueberries, tapioca and sugar, stirring well. Allow to sit while you prepare the crust. 3. Form one crust round into the pie plate. If making a braided or lattice crust you want to assemble it now on a sheet of parchment paper. 4. Pour filling into prepared pie plate and top with decorative crust. Crimp top and bottom crusts together. 5. Lightly brush top crust with the egg wash and sprinkle a little sugar on top. 6. Cover the rim of the crust with a small piece of foil or pie wrap and bake for 40 minutes. Remove wrap and continue to bake for 15-20 minutes until crust is browned. 7. Allow to completely cool (several hours) before enjoying. This entry was posted in Pies, Vegetarian and tagged blueberries, pie, summer. Bookmark the permalink. 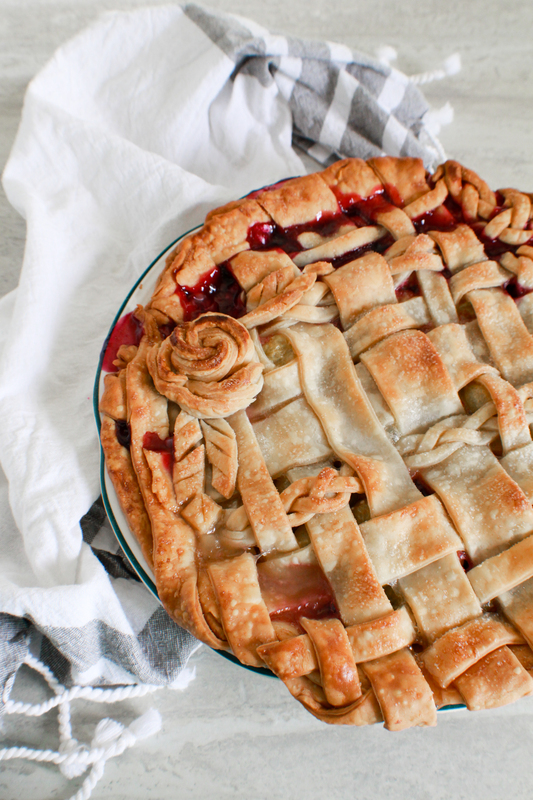 What a beautiful looking pie….